Sight Words, also known as Dolch Word list or The Dolch 220, are words in the English language that are most frequently used but most of which are not pronounced phonetically. Therefore, it is important for a child who is learning to read to be able to recognize these words simply by sight, hence the name Sight Words. This memorization of these high frequency words are part of any kindergarten and 1st grade classroom. One way to assess fluency of these Sight Words is through activities such as flash cards, worksheets, and even coloring pages. We use all of these in our classroom but a favorite of our students is the Color by Code coloring pages. These pages use the first set of High-Frequency words such as I, me, a, & go. By learning these words children can begin to explore early readers and find success, exciting their progress and propelling them to move forward and learn more. It is a great cycle that prompts literacy, reading fluency and a love for learning. 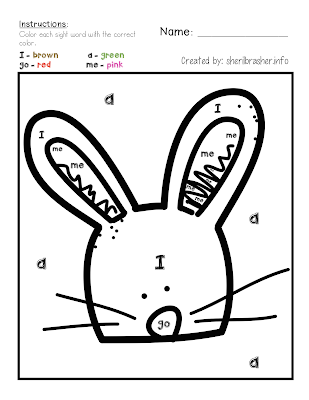 My Color by Code using Sight Words Spring Pictures complete set of 12 pages can be purchased on my Teachers Pay Teachers store but today I would like to give you one of these pages for free. Click the image below to download your FREEBIE. Today's freebie would be a great addition to a literacy center, morning work, early finisher work or just a rainy day activity. What are some ways that you teach, introduce or practice sight words and reading with your children? Let me know below so I can try it out in my classroom. Until next time, I'll see you over at sherilbrasher.info. 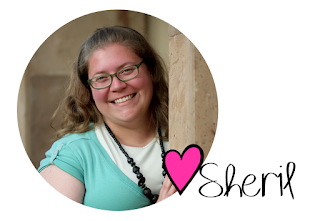 My name is Sheril and I am the Preschool Director of Little Builders Preschool in Tijuana, Mexico. Our school is made up of missionary kids which can introduce its own set of challenges. The students come from all over the world so we have multiple languages in our classrooms. Our missionaries, myself included, don't get paid as we are all support-based missionaries. This means that we rely on the generous support of friends, family, and those who want to partner with us. I am also in preparation stages for a K-12 school which will be open to the local community. Our school will be completely bilingual and an opportunity for project-based learning. I blog over at sherilbrasher.info about my life as a full-time missionary, Preschool Director and Teacher, and our Montessori Inspired schools. Look forward to getting to know you.